Nurse Gemma is a nurse-in-training in a future where the solar system has been colonized, an expansion pushed forward due to overpopulation on Earth (and one might imagine the various forms of habitat destruction that may have accompanied it). Apparently, making outerspace hospitable and habitable is still in the works, and so healthcare in the form of the corp of nurses is needed to make sure people can live during this transition period. As I mentioned, our focus is Gemma, who is nearing the end of her training program, with just a few little tests left to go before being sent forth as an actual working nurse (there’s a nice level of appreciation added that comes with knowing Skelly has been working on finishing school during her time on the series). Gemma, however, is notably not extraordinary when we meet her — quiet, not super confident and kind of gets pushed around a bit. The series opens with her fellow nurses-in-training screwing her over in order to land a coveted full-time assignment on the beautiful, romantic planet of Venus. One of the things I like especially about Nurse Nurse is how Skelly flips our expectations in regards to the set pieces. While Venus is depicted in the comic as humid as it probably actually is, it’s also a lush, beautiful place full of flowers. There, the folks (hippies?) harvest any manner of ole thing, including the one Gemma rescues from his own genetically-cultured butterflies. The how and why of the butterfly attack slowly becomes the first piece of the big mystery of the series (still unsolved). The story then starts to become a kind of episodic adventure that eventually sends Gemma packing to Mars. Again, rather than the rocky red wilderness that Looney Tunes has made us familiar with, here the red planet is more of a winter wonderland. By the fourth issue (the halfway point), some of the pieces start to come together and we find that the strange language that kind of looks like the butterfly afrodisiac [sic] goo? It tells of a prophecy that you better believe has something to do with our favorite Nurse Nurse (the titular double nurse-itive is another mystery that will clearly be a big deal by the finale). Hopefully, I’ve sold you on the books by now, because I’m hesitant to go much further giving away plot details. 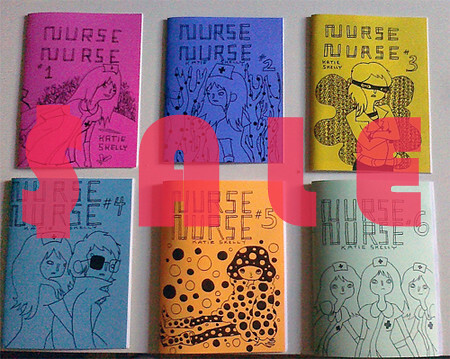 Let’s talk about Nurse Nurse as a comic, shall we? I will always have a fondness in my heart of hearts for handmade zine/mini-comics (if you want to know how much of a fondness, stay tuned to this space for some special news coming in the next couple of weeks), and so Katie wins on that front — Nurse Nurse is punk rock like that. You really feel it on the first issue, which has that thick sharpie quality that man, you can feel that “hell yeah, I’m gonna make my own comic” vibe. The line and composition gets ironed out more over the course of the series, and really, the more recent work is the most self-assuredly nice looking of the bunch. Skelly also gets bolder with her layouts in the later issues (take note of the sample shown above, taken from a post-coital bad trip). I loved Beegirl for its colors, and I’ve really come to love Nurse Nurse for its use of blacks and whites. This is one of those books that a lot of people really like, and upon reading it the reason becomes clear. Besides the cute nurse outfits, the fun extraterrestrial adventures and pleasant artwork, there’s a really nice current of an understated epic running through this. Even as things become more mythic and Gemma gets pulled into what seems to be a grand conspiracy, she’s still a lot like Beegirl — a modern girl trying to not get trampled by the rat race, a feat that requires a sassy attitude now and then. Nurse Nurse feels pretty different from a lot of other things I’ve come across, emphasized by the difficulty of pinning down a single genre to define it (for the record, I still think “Cutesy Boopsey” is one of the best classifications I’ve ever heard of). However, I could’t help but find recurrent similarities with the old Alan Moore penned 2000 AD series The Ballad of Halo Jones. Both exhibit strong world-building that continues to seep up to the forefront as the narrative progresses, especially in regards to famous intergalactic rock bands. Both feature a young female lead, portrayed in a realistic manner, just kind of getting by, who slowly gets wrapped up in a grander mission to discover their purpose as a savior of the universe. Nurse Nurse is like the stripped down, mini-comic version. Luckily, unlike the older work, we’re going to get to see Katie Skelly wrap up Nurse Nurse as intended. Or, you could wait a few years, when the wonderful folks at Sparkplug will collect the whole dang 8 issues under one roof and sell it to you that way. Or do both.